As part of its broad research project “Arab Youth as Political Actors”, the Arab Reform Initiative organized on 3 June 2018 in Tunis, a Policy Dialogue meeting that brought together 18 representatives of youth activist groups as well as political parties and traditional NGOs. The Policy Dialogue aimed to discuss the modes of action and new forms of engagement of Tunisian youth as alternative practices to political action, and to address the specific issue of the profound rupture between activist youth and the traditional political sphere. Participants to the event, both the youth activists themselves and representative of the traditional political and civil society sectors, agreed on the critical importance of understanding the reasons for this rupture and the necessity to find ways to strengthen youth new forms of engagement. However, the way forward remains hotly debated. The Policy Dialogue consisted of four presentations by youth activists, followed by two discussion sessions moderated by the lead researcher for Tunisia for the project, Dr. Mounir Saidani. A youth activist heavily involved with the Manich Msameh campaign, Malek Sghiri’s presentation focused on the lack of political representation of numerous social sectors, who find themselves outside the reach of both the Tunisian General Labour Union (Union générale tunisienne du travail UGTT) – which remains anchored in the middle class – and the political parties, despite the explosion in their number and diversity since 2011. Yet, as he explained, these sectors should be the natural base of the liberal and leftist parties. The role of Manich Msameh has thus been to federate these diverse and under-represented social sectors while also criticizing the hierarchical nature of Tunisian political parties and the paternalistic rapport they establish with the under-represented through their very mode of organization. In this way, Manich Msameh’s organizational format and its outreach is itself a new model for political representation that can serve to shed light on the lacuna of Tunisian political parties and traditional civil society actors. An independent journalist whose work covers activism and new forms of engagement in Tunisia, Henda Chennaoui’s presentation focused on the question of organizational format and the dilemmas facing youth in their efforts to achieve meaningful political impact. The basic question, as she frames it, is: how best can youth maintain their current forms of engagement in a way that is most efficient and durable? Youth initiatives are marked by innovation at the organizational and discursive level, promoting horizontality in governance and decision-making, the utilization of dialectal Arabic in political discourse, and the effort to avoid institutionalization and “NGOization.” Yet such models have proven less efficient than traditional forms of civil society and political action and are currently threatened by processes of demobilization and eventual dissolution. How to increase efficiency and durability in organizational terms thus represents one of the crucial challenges of Tunisian youth activism at this juncture. An activist involved in numerous different campaigns and groups, Samar Tlili’s presentation focused on the stagnation that horizontal governance and decision-making structures have engendered within youth groups. She cites the facility with which authorities have been able to either co-opt or indeed stifle the street action, but also the problem of mission drift within youth groups themselves, as the struggle for the plight of the most vulnerable and the achievement of 2011’s demands for social justice have been replaced by activists’ efforts to free those arrested during protests and other instances of mobilization. She also cites the series of small battles that those in power have been winning vis-à-vis youth groups, and the manner in which media coverage has successfully weakened the image of youth activism by exposing internal conflicts and negative images of these social movements. In response, youth groups have focused on rehabilitating their public image rather than achieving their broader socio-economic goals. One key dilemma facing youth groups has been the debate on whether to focus on short-term goals linked to the groups themselves, or long-term goals linked to broader processes of social and political change. The status of youth activism in Tunisia, she explains, has been further weakened by the co-optation of youth activist leaders by traditional civil society, and the authorities’ efforts to delimit the physical spaces of mobilization and re-establish spatial order over the field of opposition and contestation. This reduction in the physical space of youth activism has been compounded by the authorities’ increasing ability to channel and re-direct popular anger, thereby reducing the potential audience of youth groups. She recognizes the need for youth activists to exit these schemas and find new ways to redirect their energies to achieve the broader goal of social justice, yet also recognizes the complexity of the question and the lack of internal consensus for so doing. Khairi Debaya, an environmental activist in Tunisia’s neglected southern region, focused his presentation on the way in which youth activism post-2011 has signaled a new manner of “doing politics” that has surpassed the abilities of traditional political actors. As he explains, since 2011 activism and civil society have been ahead of political parties in their understanding of the political stakes and the key socio-economic grievances of the marginalized. Youth groups in particular were able, through their action, to acquire detailed knowledge and expertise of the most salient issues effecting the country’s poorest. However, the lack of coordination between initiatives has lowered their success, and youth groups are at risk for seeing their popular legitimacy co-opted by either political parties or traditional actors such as the UGTT. The discussion following the presentations focused on several broad issues, including how patterns of mobilization and engagement in Tunisia are (or are not) influencing the political sphere, and the ability and options for activist youth to convert their current modes of engagement into more sustainable and efficient forms of political organization. One participant spoke of the profound changes in political action occurring not only in Tunisia but across the globe since 2011, and the pointed effort to shift political representation from vertical to horizontal structures, yet the persistent problem in the Arab world of social movement stagnation and the inability to convert movements into viable political forces. In response, another participant brought forward the problem of political efficiency of movements, and that their own process of organizational structuring only commenced in 2014, several years after the initial momentum of the Arab uprisings, and once the backlash against revolutionary action commenced in earnest. To this point, participants exposed the existing gap between those who desire change and those who have the capacity to achieve it. Today, this plays out in two distinct camps within the field of contentious politics: those pushing for reform to the existing system and those seeking its overhaul entirely. For the moment, the reformist branch has more influence over the political process, in large part because the revolutionary forces have lacked a rallying leader and clear vision since 2011. Indeed, participants cite the year 2014 as a critical low moment in the transition process, when the effort to enact political change was replaced by the day-to-day grind of “doing” politics. The is combined with a lack of ideological clarity that has a negative effect on the potential for political influence of social movements. With regards to political parties, the effect of 2011 and the new forms of engagement across the Tunisian political arena also had an important impact on their organizational formats and policy platforms, with numerous parties experimenting in terms of their programme outlines and ideological positions, especially during the period of 2011-2014. However, the country’s broader framework of legal and constitutional disorder has prevented these experimentations on the part of political parties from achieving tangible policy impact. Too many parties still operate in a vertical fashion, with opaque decision-making processes, and the problem of absenteeism from formal legislative instances remains a barrier to achieving goals. For one participant, though, the disappointing results thus far achieved by political parties must also be seen in light of the short time-frame of assessment: the process of democratization is long, and Tunisian political parties are still in their infancy. Likewise, civil society activists prior to 2011 had little experience in political contestation and mobilization, and thus their difficulty to adopt the most efficient organizations and structures to convert to more durable political forces is perhaps a natural part of the learning and development process. This discussion opened up to a much larger and more critical debate about institutionalization and whether or not youth social movements should re-organize themselves as political parties or not in order to have a more important impact on public policies and the achievement of social justice. On one hand, the process of re-organizing as a political party translates to a certain loss of freedom for the sake of partisan political engagement, yet this, coupled with more vertical structures, can be a source of efficiency. At the same time, though, the desire to remain independent of political parties still resonates for many engaged and activist youth and is linked to their disappointment with traditional politics. There is still an ambition to find a mode of political organization that is different from that of political parties, to re-invent an organizational model that does not reproduce the models of the past. With regards to the rupture between political parties/the political sphere more broadly and youth activists, the discussion sought to explain the sources of this rupture and the impact on youth new forms of engagement. One participant spoke of the facility with which engaged youth could be co-opted by political parties through the use of independent lists during electoral processes, and the ensuing reproduction of hierarchies within social movements. Indeed, the lack of clarity on the part of youth activists with regards to the political system and how to position themselves, and the inexperience of youth in terms of political organization more broadly, has resulted in an inability to produce a new political model. There is no consensus on whether political parties can or should be allies of youth initiatives. Yet for another participant, the problem of rupture with the political class and the negative effects on youth engagement are not solely the fault of political parties: youth groups themselves face an important problem of internal division and demobilization that must be addressed. Despite the general frustration and disappointment with the lack of political renewal both at the level of parties and youth new forms of engagement, participants did acknowledge that certain gains have been achieved. The struggle for citizenship has been generalized across the population, demonstrating an awareness of rights and a transformed relationship between the individual and the State; however, there is still a lack of concrete strategy for transforming this newfound sense of citizenship into policy and legislative objectives. The second discussion revolved around the broader theme of political renewal in general. The question of efficiency, defined as the ability to achieve policy goals and political vision, was proffered as the most primordial element to which a political force should strive. Yet, the means to achieve this efficiency are not obvious. The mediascape in Tunisia was cited as a major obstacle, given its corrupt nature and ability to sway public opinion. 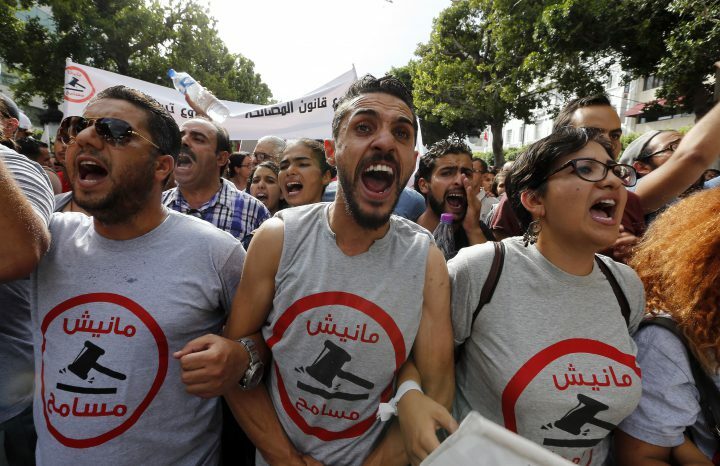 More broadly, the current political scene in Tunisia was also cited as an obstacle, given the threats to the democratic transition process that legislation such as the “Reconciliation Law” granting amnesty to public officials of the Ben Ali era pose. Beyond such obstacles, however, participants also question how their own movements should act strategically in order to achieve efficiency. Should they limit themselves to 2-3 major political issues to focus their energies? Likewise, how can various struggles that are currently playing out independently across different geographic and sectoral areas be federated to increase constituencies? These are critical issues that youth initiatives must address in order to fight current stagnation and continue to contribute to political renewal in Tunisia. The country has institutions that are relatively solid, which is a point in its favour. Yet, these institutions do not necessarily address the broad popular demands for representation and social justice. Another critical issue is thus: what role can the country’s activist and engaged youth – who currently express their profound dissatisfaction with the traditional political sphere – contribute at the institutional and legal level to Tunisia’s political renewal in a manner that meets 2011’s battle for social justice and equality?